• Contains two pads of neon green, one pad of neon purple, ultra green, klippan blue and periwinkle blue. • Repositionable notes, will not leave residue. 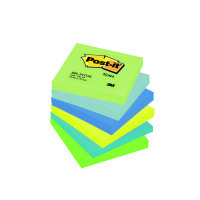 Ideal for desktop use, these repositionable Post-it Notes feature a strong adhesive that will adhere to most surfaces and remove cleanly, which is perfect for making notes or leaving messages and reminders. Each pad contains 100 sheets and measures 76 x 76mm. This pack contains 6 pads in assorted Dream colours: pastel green, sky blue, retro blue, neon yellow, ultra blue and ultra green.